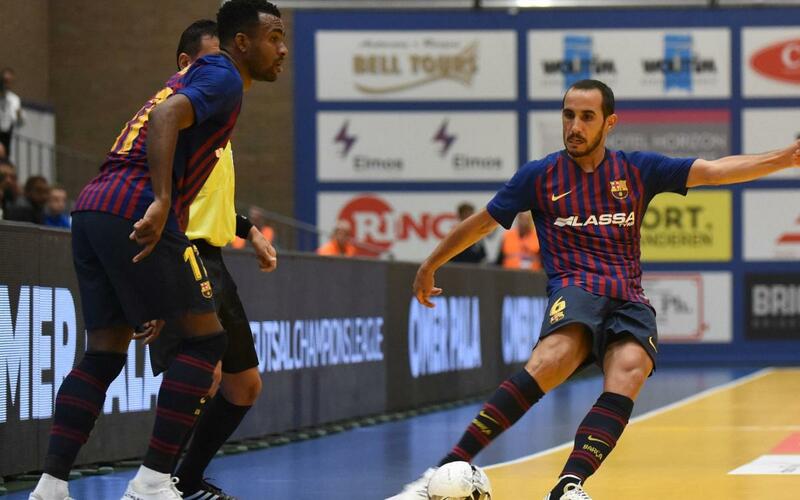 After beating Kremlin-Bicêtre United of France in the opening game, Barça Lassa drew 1-1 with Benfica on Thursday, a result that puts both of the two ‘giants’ in Group 1 within touching distance of a place in the Elite Round. A draw with host club Halle-Gooik on Saturday at 8.00pm CET would be enough to secure one of the three berths on offer, but if other results go their way, Barça may have already qualified by then anyway. The encounter with the side from Lisbon was a tense, cautious affair, with great goalkeeping at either end the highlight of a scoreless first half. But although the Catalans generally seemed to have the upper hand, it was Benfica who took the lead on 31 minutes through Fabio Cecilio. With five minutes to go, it was time for rush goalie tactics, and it paid off when Leandro Esquerdinha blasted home a delightful free-kick.